Sometimes ya just gotta go with the Flo. 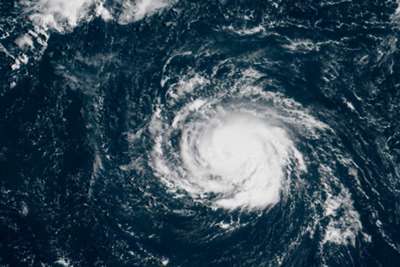 American college football teams in the southeast of the United States were rescheduling, postponing and cancelling games this week as Hurricane Florence was expected to make landfall late on Thursday or early Friday on the North and South Carolina coastline. Elsewhere around American sports, the New York Yankees floundered, Aaron Rodgers' right knee was under a microscope and — only appropriate in the current meteorological context — the Seattle Storm won the WNBA championship. Here's a look at the week on the American sports landscape. 1. This is the story of a hurricane. The threat of Hurricane Florence has already had an effect on this week's college football and could potentially impact some NFL and MLB games. The three most high-profile games to have fallen foul of the weather are East Carolina at Virginia Tech, West Virginia at N.C. State and Central Florida at North Carolina. The schools involved will attempt to find ways to reschedule the games. The emergency did offer a glimpse of positivity as mandatory coastal emergency evacuation plans took effect in the Carolinas. Three NASCAR race tracks in the region — Charlotte Motor Speedway in North Carolina, Atlanta Motor Speedway in Georgia and Talladega Superspeedway in Alabama — announced that they would open surrounding campgrounds for evacuees heading west or inland. Colgate University football coach Dan Hunt, whose team's game in South Carolina was cancelled because of the storm, donated the hotel rooms his team would have needed as well as the meals the university had ordered to evacuees. The Yankees are starting to sweat on their American League wild-card with the possibility of a cross-country trip to Oakland Athletics for a one-game playoff becoming a distinct possibility. A 3-1 defeat to the Minnesota Twins on Wednesday saw the Yankees fall to 4-6 in their last 10 games. Meanwhile, Oakland are 8-2 in their last 10 after a 10-0 drubbing of the Baltimore Orioles. The Yankees (90-56) have 16 games left on their regular-season schedule — six against their arch-rivals the Boston Red Sox, who have reached 100 wins for the first time since 1946 — but New York simply have not got it done offensively since the calendar flipped into September. The Yankees have hit .194 as a team with 67 hits and 95 strikeouts in their 11 games since the start of the month, going 5-6. Are the Yankees in the midst of a Collapse? If you are not familiar with baseball, there is an old expression: "Baseball, man." Translation: Just when you think you have seen it all, you see something new. And a one-game playoff in another team's ballpark ups the ante. 3. Practice? We're talking about practice? Green Bay Packers quarterback Aaron Rodgers injured his right knee on Sunday after Chicago Bears defensive end Roy Robertson-Harris fell on him with just over nine minutes remaining before half-time. He left the field on a medical cart but surprised everyone by coming back out for the second half. He completed 17 of 23 passes for 273 yards and three touchdowns to lead the Packers to a 24-23 victory in the biggest fourth-quarter comeback in Green Bay history. For the Minnesota Vikings, the Packers' opponent this week, there is no question they will see Rodgers play, despite the knee injury. #Packers QB Aaron Rodgers provides an update on his knee injury & looks ahead to #MINvsGB in Week 2. Packers coach Mike McCarthy said his quarterback will rehab rather than practice as the team continues to monitor his "day-to-day" status – Rodgers calls the knee "super-painful" – and determine his availability for their home opener. But when asked if he needed to practice to be ready to play on Sunday, Rodgers was succinct: "Nope." "It's incredible to be sitting here right now," the 17-year veteran said, as quoted by the Seattle Times. "This is probably going to be one of the defining moments of my career. To have played however many years I've been playing, to have won in all these places, but then to do it at the end in such a way that was different from all the others, it's really incredible." Bird, 37, finished with 10 points and 10 assists to bolster Finals and league MVP Breanna Stewart, who saved her best for last: 30 points – a career-high for the playoffs – on 11-of-22 shooting, including four 3-pointers on five attempts. The Storm became the sixth team to sweep a Finals in three games – something the team did in 2010. Seattle's other title came in 2004.